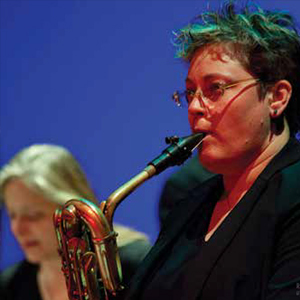 Considered the most important female saxophonist to emerge on the Australian jazz scene since Sandy Evans, Lisa’s talent was recognised by band leaders such as John Pochee, Paul Grabowsky and Lloyd Swanton who invited her to join their bands Ten Part Invention, the Australian Art Orchestra and The catholics, for specific projects. She won the Mo Award for Best Female Jazz Performer in 1991 and ’92, was placed third in the National Jazz Awards for saxophone at the 1994 Wangaratta Jazz Festival. More recently she was placed 5th in the 69th Downbeat Reader’s Poll. Moving to New York in the late 1990s Lisa is busy with club and festival appearances, tours as well as teaching. Her music is represented on nearly 30 CDs recorded here and overseas, the most recent of which “The Awabakal Suite” is a project with her sister, bassist Nicki Parrott. Join us for a pre-concert talk as we hear about Lisa’s career and life in New York City as a jazz musician. This exclusive Sydney performance has her teaming up with long time musical buddies for what we know will be a night of unforgettable music. Presented by arrangement with the Wangaratta Jazz Festival.